After six and a half months, I finally got my hands on the NTorq. What can I say, my colleagues Jared and Shivank simply refused to share the scooter! My daily commute is roughly 80 kilometers; therefore, I spent some quality time with the NTorq, and it is one sweet ride, especially in urban conditions. With a slightly firm suspension setup, it handles like a charm and confidently tames corners. With chunky 12-inch tyres, light handle bars and spot on handling balance, the NTorq is a treat for an enthusiast. 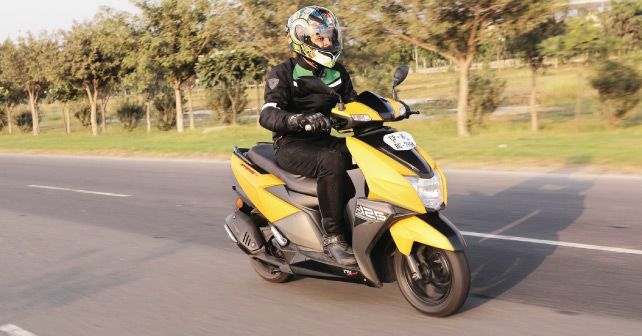 Now coming to the 125cc engine, which produces 9.2bhp, it’s certainly one happy revving motor. As you open the throttle, within no time, you find yourself leaving most of the sub-150cc bikes behind without any stress. On flat tarmac the NTorq provides a plush ride quality, but when encountered with ditches, it tends to crash a bit. Another thing I noticed is that the rear brakes are very sharp, and when applied, they feel as if someone is yanking you back. Personally, it’s a bit unnerving, therefore, kindly handle with care. Also, with limited floor board space, at best you can place a carry bag with the help of a hook on the front apron – placing a backpack can be a tight squeeze. All-in-all, I had a great time riding the NTorq. It’s great to see that for a change a ‘powerful’ scooter actually walks the talk.